This is a review for the supplement Diamond Herpanacine Mind supplement. According to the manufacturer, this product is meant to unlock a person’s full potential when it comes to their cognitive function. It is supposed to help your brain focus and a grants mental edge required for success. If you are interested in learning more about this product and whether or not it’s suited for you, keep reading this review. The product also contains soy but is free of: gluten, milk, eggs, shellfish, fish, peanuts, tree nuts, and wheat. It is non GMO. It is recommended you take 1 tablet twice daily. There is no specification as to whether or not this product should be taken with a meal or what times it should be taken. We speculate that since it is twice daily, it is best to take one in the morning and one at night. As with any supplement, it is ideal for you to speak with your physician before taking any type of dietary supplement. If you are pregnant or nursing, taking medication, or have an already existing medical condition, do not take this product unless you are cleared to do so by your doctor. Discontinue use if any odd symptoms occur. The price for 60 tablets is $24.99. There is currently no discount. You can however, join their “Auto-Ship Program” where you will receive your ingredients at the beginning of each month. There is no information on their return policy or a customer satisfaction guarantee. We have thoroughly researched the site and have found no information on the matter. There is an option to contact the company with any questions or inquiries you have so this may be the best option to find out if they grant returns. The customer reviews found on the website are all positive. They seem too good to be true. Many claim this product works great in conjunction with other products the company offers. Some of the reviews we found on other websites were a little less enthusiastic. Some claimed it worked while others weren’t impressed by the results. 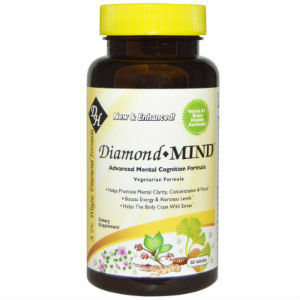 Diamond Herpanacine Mind seems to be another product where it claims a person will gain such clarity and mental focus. It’s priced reasonably and the company does offer an auto ship option. However, with the lack of information on the return policy or guarantee, this may not be ideal for new customers who are looking to try out a new supplement for their cognitive function. Also the testimonials on the website seem too good to be true, since they are all extremely positive. This may mean the company selects which reviews are posted. Overall, we think there is a better product for your and your cognitive needs. Henry Costa	reviewed Diamond Herpanacine Mind	on November 20th	 and gave it a rating of 3.